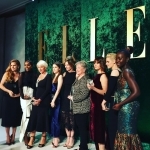 Kristen comparece ao ELLE Women in Hollywood Awards em Los Angeles : Kristen Stewart Brasil || Sua melhor fonte brasileira sobre a atriz Kristen Stewart. Kristen com a Kathy Bates e Felicity Jones ? Kristen com a Felicity Jones e Lupita Nyong'o ? Kristen com a Anna Kendrick, Lupita Nyong'o e Amy Adams! ?